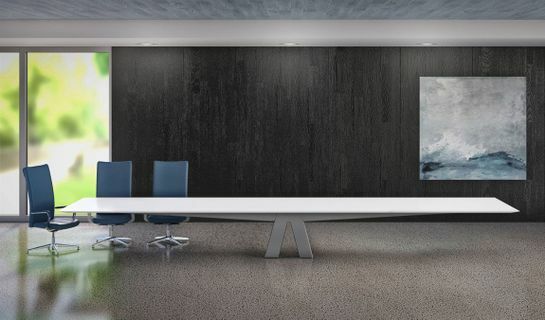 This Ultra Modern Conference Table design provides the perfect balance of form and function to turn any conference environment into an impressive design statement. Its patent-pending, revolutionary design leverages a single base to create the illusion of a floating surface up to 20 feet. This unique table design establishes an incredible span of aesthetic possibilities. With a neutral finish, the base disappears, putting the focus on the floating top. Choose centered or offset cantilevers to add drama, while different finishes for the base and cantilevers create a more expressive, two-tone aesthetic. Additionally, the optional exposed truss aesthetic creates a structural statement, complementing current architectural forms. Unimpeded knee space is enjoyed at every position around the table. Designed for technology integration, it includes base and trough covers to conceal power and cabling without compromise.